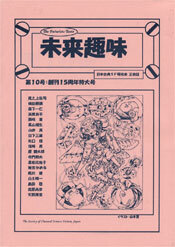 Mr. Terakado is also known as a collector of science fiction movies of the 1950’s. He is a member of the Society of Classical Science Fiction, Japan, and he has been writing a series of articles for the Society's magazine, The Futurists' Taste; “Shadows of the Mad Doctors” （2002） and “the Sudden End of the World” （2003）. From his viewpoint, not only major science fiction movies of the 50’s like Forbidden Planet and This Island Earth, but also a large number of B class movies of the same era, have already contained the basic kind of constituency of science fiction as in the contemporary Hollywood Science Fiction movies.